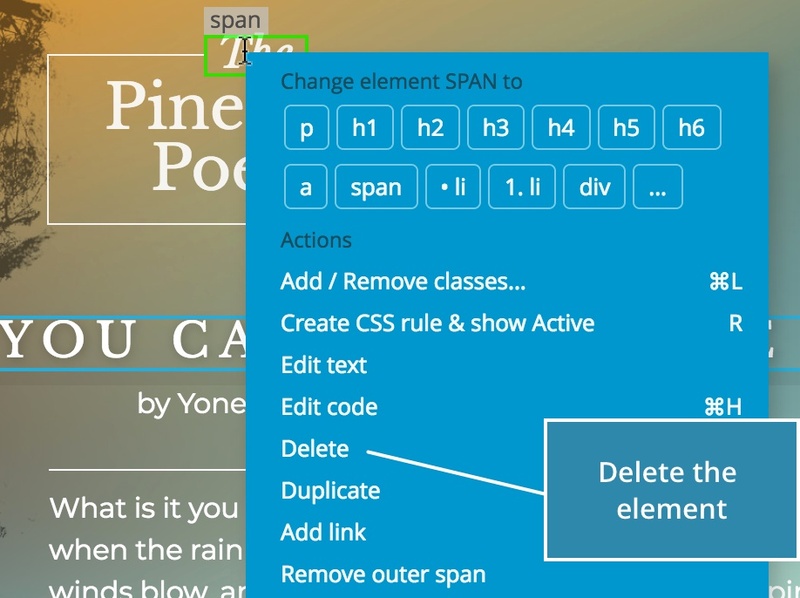 Let’s take a look at how you can delete HTML elements from the page. As always in Pinegrow, you can do that in a couple of different ways. Choose the one that suits your task at hand the most. This operation will delete all selected elements. Right click to display the element menu. NoteYou can use right click to display the context menu even for the elements that are not selected. Shortcut Use DELETE or BACKSPACE to delete all selected elements. This keyboard shortcut is not available in _ACTIVE text editing mode. Use the in the selected element menu in the Tree to delete all selected elements. You can also right click on any element in the Tree, even if it is not selected, and remove it with a Delete menu command. NoteDeleting a selected element with the right click menu will delete all other selected elements as well. Doing the same on a not-selected element will delete just that element.